The Patient-Driven Payment Model (PDPM) will replace the RUG-IV system currently used for skilled nursing facility (SNF) payment. Unless CMS makes any changes in program implementation, we anticipate the effective date of the change to be October 1, 2019. The PDPM proposes to use a person-centered and holistic approach to resident assessment by integrating the scope of clinical complexity with reduction of focus on the quantity of therapy minutes for purposes of categorizing reimbursement groupers. The PDPM program has six payment components. Five of the six are case-mix adjusted. These components for classification and payment include: Physical Therapy (PT), Occupational Therapy (OT), Speech Therapy (ST), Non-therapy Ancillary (NTA) as well as Nursing. The sixth component incorporates one non-case mix adjusted component, which reflects operational costs such as room and board. Each resident will be assigned to each of these six components regardless of services provided. Based upon MDS data, the resident might be assigned to each of the five case mix adjusted components. A resident profile will be some combination of these five categories. The PDPM contains 16 PT groups, 16 OT groups, 12 Speech groups, six NTA groups, as well as 25 nursing groups (which is down from 43 nursing groups). Each of the separate case-mix components has its own adjusted index with a corresponding per diem rate. Three of the categories (PT, OT and NTA) have adjustable per diem structures that allow for changes in rates related to shifting resources required during the resident’s stay. For example, the PT and OT base rates are reduced by 2% for every successive seven-day period beginning on day 21. Additionally, the NTA component multiplies by a factor of three for the first three days and then reduces to a factor of one beginning on day four and remains constant for the remainder of the stay. The total per diem rate is calculated by adding the variable components of PT, OT, and NTA rates to the non-variable Nursing and ST components as well as the non-case mix adjusted component. Therapy components might utilize up to 25% of total minutes provided with concurrent or group therapy modalities. If centers exceed 25%, the QIES ASAP Validation reports will reflect this. Administration should consider their method to monitor this. The quantity of therapy minutes provided will be based solely on the clinical judgment of the care team. Additionally, the intensity of therapy services will be based on resident need rather than a reimbursement (RUG) category. Accurate diagnosis coding on the MDS via ICD-10 codes upon admission will be crucial. There are important complexities, considerations of Primary/Secondary Diagnosis, as well as Principal Diagnosis. This is also important related to medical comorbidities. The Principal Diagnosis is often misunderstood; some consider it the same as the Primary Diagnosis which is, in fact, not so. The Principal Diagnosis code reflects the condition established after study to be chiefly responsible for occasioning the admission of the patient to the facility (in –patient setting). For example, a resident with Alzheimer’s Disease who is on your long-term unit and has a fall and fracture will return with the same Principal Diagnosis as noted on the UB box 69 (reason why the resident was admitted to your facility). The Primary Diagnosis is the reason why the resident requires skilled care. The Secondary Diagnosis is a supportive diagnosis and/or is related to other conditions that affect the resident’s care and/or length of stay. The PT and OT components will be assigned to their respective case mix group based on the ICD-10 code (derived from MDS Section I0020B in combination with surgical procedures designated on sections J2100 thru J5000) and cross-walked to one of four major categories as well as a functional score derived from section GG. The Nursing component will use similar criteria to the current non-therapy RUG classifications for assignment to its respective case mix group. For example, clinical characteristics that currently place the resident into the Extensive Services, Special Care High and Low, Clinically Complex, Behavioral and Reduced Physical Function RUG categories will be used in PDPM along with the functional score (now derived from section GG rather than section G). These clinical characteristics will continue to use indicators of depression (derived from the PHQ-9 score on section D [Mood]) as well as two restorative nursing programs six times per week to determine the “end-splits” for calculation. The NTA category incorporates additional comorbidities such as COPD, morbid obesity and pressure ulcers into the per diem rate. Additionally, the NTA has a modifier for parenteral/IV feeding. There are 50 potential comorbidities that might factor into the NTA with a weighted structure (e.g. some diagnoses assigned more points than others). The NTA then sums the number of comorbidity points (up to 12) to assign its designated case mix group. A diagnosis of HIV/ Aids will affect the Nursing component with an 18% add-on. Additionally, this diagnosis will count for one of the comorbidities on the NTA (eight points on the weighted score). The designation or “trigger” for the HIV/ Aids diagnosis will derive from a “B20” code used on the SNF claim (not from the MDS). Please be advised this should be reflected on your diagnosis listing to then be pulled to your UB 04. As a reminder, this is a privacy protected diagnosis. For more information on this please reach out to us or our Director of Health Information, Heather Py, RHIT, CCS, CPHS, RAC-CT, for support. These five characteristics will derive from diagnosis coding (cross-walked to acute neurologic, non-neurologic and SLP- related comorbidity), as well as MDS items from Section C (BIMS score) and Section K (mechanically alter diet and swallowing disorder). The PDPM will require only two MDS assessments (a 5-day assessment and Discharge assessment). There will also be an optional Interim Payment Assessment (IPA), which facilities might complete if clinical characteristics determine that there would be a change in the case mix groupers (e.g. in at least one of the five case mix adjusted components). For residents that initiated their Part A stay prior to October 1, 2019, and continued after October 1, 2019, an IPA assessment will need to be completed for each Part A resident to determine a HIPPS modifier for billing effective October 1, 2019. Facilities will have until October 7, 2019, to complete each of these assessments without incurring penalty. For additional information related to PDPM, ICD-10, or related topics, please contact Nathan J. Shaw at [email protected] or Robin A. Bleier at [email protected], or call us 727.786.3032. Recently we have had a surge of provider requests to review Florida’s staffing requirements. To review 400.23(3), a minimum weekly average of certified nursing assistant and licensed nursing staffing combined of 3.6 hours of direct care per resident per day. A reminder a week is defined as Sunday through Saturday. A minimum certified nursing assistant staffing of 2.5 hours of direct care per resident per day. A facility may not staff below one certified nursing assistant per 20 residents. A minimum licensed nursing staffing of 1.0 hour of direct care per resident per day. A facility may not staff below one licensed nurse per 40 residents. A facility that has failed to comply with state minimum-staffing requirements for two consecutive days is prohibited from accepting new admissions until the facility has achieved the minimum-staffing requirements for six consecutive days. For the purposes of this subparagraph, any person who was a resident of the facility and was absent from the facility for the purpose of receiving medical care at a separate location or was on a leave of absence is not considered a new admission. Failure by the facility to impose such an admissions moratorium is subject to a $1,000 fine. A facility that does not have a conditional license may be cited for failure to comply with the standards in s. 23(3)(a)1.b. and c. only if it has failed to meet those standards on two consecutive days or if it has failed to meet at least 97 percent of those standards on any one day. A facility that has a conditional license must be in compliance with the standards in s. 23(3)(a) at all times. For success, we need to evaluate our system of staffing, how it interrelates with our facility assessments, who and how it is coordinated on a daily, weekly, and monthly basis. Ongoing evaluation of effectiveness is key, and it is encouraged to add this in your monthly risk meeting if not already in place. Not from a compliance standpoint alone, but rather to determine whether we are meeting the residents’ needs and how we staff to affirm care and services related to acuity. For more information, contact Robin Bleier at [email protected] or call 727.786.3032. While the determination of how the skilled nursing facility (SNF) staffs is based on the results of the facility assessment (FA) to recognize the specific needs of the organization, the intent of this information is to review the minimum staffing considerations to be incorporated as well based on recent provider questions. A minimum weekly average of certified nursing assistants (CNAs) and licensed nursing staffing combined at 3.6 hours of direct care per resident per day. As used in this sub-subparagraph, a week is defined as Sunday through Saturday. A minimum certified nursing assistant staffing of 2.5 hours of direct care per resident per day. In addition, remember that SNFs may not staff below one certified nursing assistant per 20 residents at any time. A minimum licensed nursing staffing of 1.0 hour of direct care per resident per day. In addition, remember that SNFs may not staff below one licensed nurse per 40 residents at any time. Complying with minimum staffing requirements include a variance based on having a conditional license. A SNF that has failed to comply with state minimum staffing requirements for two consecutive days is prohibited from accepting new admissions until the SNF has achieved the minimum staffing requirements for six consecutive days. be noted that the requirement includes that failure by the SNF to impose such an admissions moratorium is subject to a fine of $1,000. A facility that does not have a conditional license may be cited for failure to comply with the standards in s. 400.23(3)(a)1.b. and c. only if it has failed to meet those standards on two consecutive days or if it has failed to meet at least 97% of those standards on any one day. A facility that has a conditional license must be in compliance with the standards in s. 400.23(3)(a) at all times. As noted, these are applicable clinical staffing required minimums only. The determination of the actual number, credentialing type, assignments and shift determinations are to be established by your individualized SNF facility assessment. Thus, your actual staffing pattern would be best reflective of your evaluated needs to meet the challenges of your resident characteristics, internal and external considerations, etc. Since the implementation of Section GG on the MDS in October 1, 2016, facilities have grappled with best practices on how to gather data for appropriate completion. While many organizations (in our experience) have opted to simply “have therapy complete this section” the updated RAI manual (V1.16) effective October 1, 2018, has implemented new items to this section. Thus, the issue of best practices to gather data for appropriate completion have resurfaced. This article will discuss our interpretation of the updated RAI manual as well as recommended best practices to gather data for appropriate section GG completion. First, when discussing “steps for assessment,” the RAI manual V1.16 (Chapter three, section GG, page GG-9) discusses “…an interdisciplinary team of qualified clinicians is involved in assessing the resident during the three-day assessment period.” Additionally, this section of the manual discusses having documentation to support coding in the resident’s medical record. Thus, we contend that simply “having therapy complete this section” is not the best practice. When reviewing individual items on section GG we recognize that there are certain areas that might be observed by nursing as well as therapy staff (e.g. rolling on side, transfers, etc.). However, there are other items where therapy only might have the opportunity to make observations (e.g. walking up and down stairs, picking up objects, walking on uneven surfaces, etc.). Here we recommend a combined approach where nursing might complete portions of section GG, daily for the three day observation (first three days of a PPS stay or last three days of a planned discharge from Medicare Part A). Additionally, while therapy would compete a full section GG on their evaluations, we recommend that the MDS Coordinator ultimately code the entire section GG on the MDS with consideration of the nursing as well as the therapy documentation to determine the resident’s “usual” function over the three day observation. GG0130A-H: Eating, Oral hygiene, Toileting hygiene, Shower/ bathe self, Upper body dressing, lower body dressing, Putting on/ taking off footwear. GG0170A-F: Roll left and right, Sit to lying, Lying to sitting on side of bed, Sit to stand, Chair/ bed-to-chair transfer, and toilet transfer. For additional information related to Section GG best practices contact Nathan Shaw at [email protected] or Robin Bleier at [email protected] or call 727.786.3032. Root cause analysis (RCA) is a method of problem solving used to identify faults, problems and/or complications. 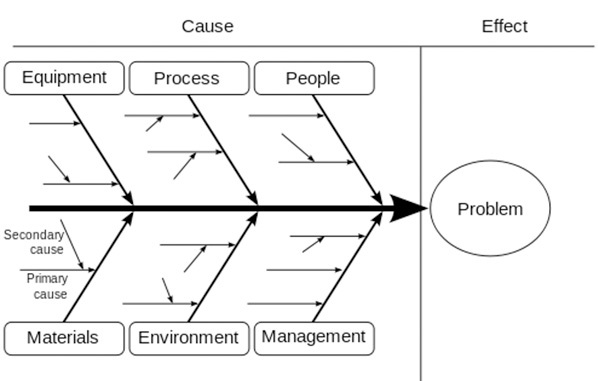 When the “root cause” is identified and changes are implemented, centers can interrupt the fault-sequence, thus preventing the undesirable outcomes from reoccurring. It is not a single or sharply-defined process using various tools and processes. A causal factor is one that affects an event’s outcome; however, the problem-fault-sequence is not eradiated as it is not a root cause. Thus, the causal factor helps to minimize problems but does not remove them. Environment – the conditions, such as location, time, temperature, and culture. The basic concept was first used in the 1920s and is considered one of the seven basic tools of quality control. It is known as a fishbone diagram because of its shape, similar to the side view of a fish skeleton. Materials, Environment and Management, all affecting the overall problem. The original 6 Ms used first by the Toyota Production System have been expanded by some to include the following and are referred to as the 8Ms. However, this is not globally recognized. It has been suggested to return to the roots of the tools and to keep the teaching simple while recognizing the original intent. Most programs do not address the 8 Ms. Both the Centers of Medicare & Medicaid Services (CMS) and The Joint Commission (TJC) look to providers and organizations to use and reflect the benefits of RCA. CMS has tools available without fee to help provides reach root causes, noting that QAPI promotes the systematic approach to determine root causes. The TJC framework for RCA and Action Plan provides examples of systematic analysis. This framework includes 24 questions that are intended to provide a template for analyzing an event. RCA is an accepted risk management process. It is not a single, sharply-defined methodology. There are many different tools, processes and philosophies for performing RCA, and despite the different approaches there are common principles. An important benefit is that RCA helps the user identify the root cause of fault sequence of a problem, ultimately to resolve the problem. RCA practice after identification is to solve by correcting the cause or events as opposed to simply addressing the symptoms of the problem.